B No. 2 Sketch of Buttermilk Channel New York Harbor. 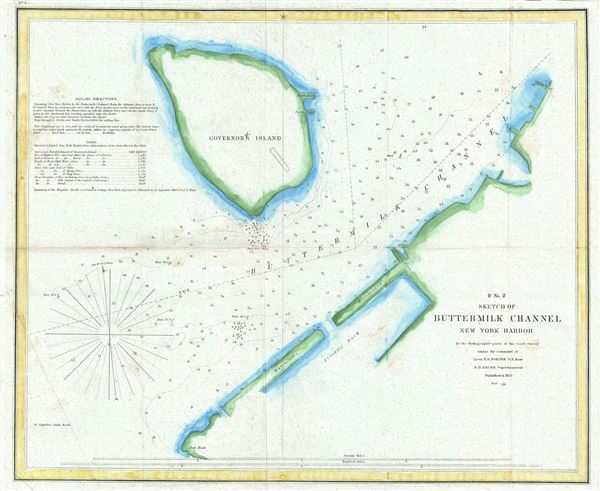 This is an uncommon 1849 U.S. Coast Survey nautical chart or maritime map of the Buttermilk Channel in New York Harbor. Separating Governor's Island from Brooklyn, the Buttermilk Channel is approximately a mile long tidal strait in the upper New York Bay in New York City. This chart covers from Governors Island to Red Hook in Brooklyn, and includes the Atlantic Basin (Atlantic Dock and warehouses), built just two years before this chart was published. The chart contains a wealth of practical information for the mariner from oceanic depths, to notes on tides and sailing instructions, positions of buoys, etc. This chart was published by the Hydrographic party of the Coast Survey under the command of Lieutenant D. D. Porter of the U.S. Navy and was compiled under the direction of A. D. Bache, Superintendent of the Survey of the Coast of the United States and one of the most influential American cartographers of the 19th century, and issued in the 1849 edition of the Superintendent's Report. Bache, A. D., Report of the Superintendent of the United States Coast Survey, (Washington) 1849.